Primary Beginnings on Spring Forest Rd. Primary Beginnings Child Development Center is committed to your child’s early childhood learning and development. We provide a curriculum that offers children a variety of educational experiences to jump-start their creative learning. 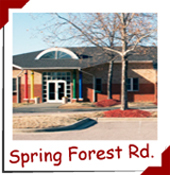 Our Spring Forest preschool location is conveniently located in North Raleigh, easily accessible from I-540. Every day, Primary Beginnings provides children with a variety of strategically planned activities based on weekly themes. Our Spring Forest location holds a 5-star license from the Division of Child Development and Early Education. We offer child care programs for infants, toddlers, preschoolers, and after school care for K-5th graders. Our infant care program starts at 6 weeks of age. Our curriculum for infants is structured around the needs of infants in the early stages of childhood development. Our experienced teachers are committed to providing the love and care that your baby needs and deserves to maximize their development. Primary Beginnings child care for toddlers focuses on the curious attitude that 1 and 2-year olds display. Our Raleigh preschool starts with the skills they learn as infants and continues to develop them. Sensory, socialization, motor skills, and toilet training are all part of our toddler curriculum. Each day, children participate in different activities, each stimulating their learning through creativity. Our preschool offers a curriculum that builds self-esteem and self-confidence in each child. Primary Beginnings’ program includes building creativity, literacy skills, and Spanish classes to help develop language skills. We work to prepare our preschoolers for Kindergarten by forming a solid foundation for emotional, social, cognitive, and physical development. All of our child care programs are centered around the developmental milestones and skill-sets of each age group. Our staff takes all the necessary precautions to keep your children safe and healthy. It’s our privilege to care for your child, so we make it our priority to provide the love and care that parents expect from a 5-star preschool. Learn more about our child care and preschool and schedule a tour of our Spring Forest location today! I have my two year old daughter in Ms. Shiesha's, Ms. Veronica's and Ms. Vicki's class at the North Hills Primary Beginnings. I have been well pleased with the way she and I have been treated there. The staff is friendly to talk with, the center is clean and colorful. There are always cute works of art all around the walls which the children have made. The breakfasts and lunches are well balanced and varied. I have also been very impressed with the Director and Assistant Director. Both ladies are very supportive and are nice to work with.